to master and is a powerful design tool. Fun and learning are sure to soar! own records, with your own impressive glider designs! 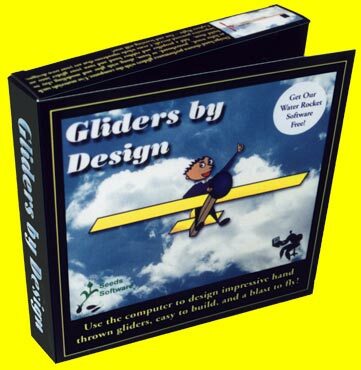 Gliders by Design is our basic flight unit. Consider our Introduction to Airplane Design software package as another option if you would like to have a comprehensive curriculum resource on flight with many layers of challenge. Introduction to Airplane Design includes more background on flight along with additional instructional content, supporting ready to use lesson activities, and lab write-ups that can be used for days and weeks of studies along with the software. It easily fits in with technology, science, physics, and math studies. Not only can you design and evaluate gliders, you can learn about powered flight and use it to design and evaluate your own rubber band propeller powered aircraft to build and fly as well.